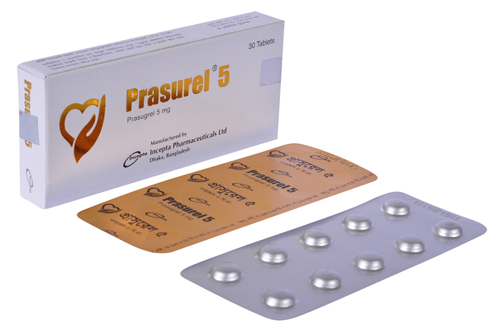 Prasurel 5: Each tablet contains Prasugrel Hydrochloride INN which is eq. to prasugrel 5 mg.
Prasurel 10: Each tablet contains Prasugrel Hydrochloride INN which is eq. 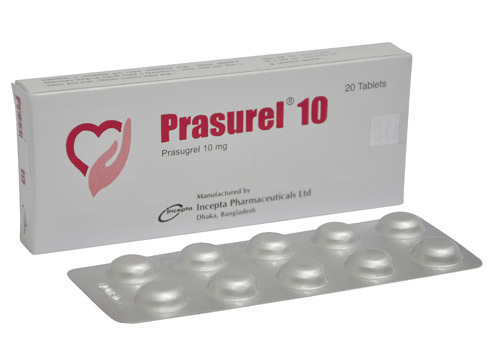 to prasugrel 10 mg.
Prasurel is an inhibitor of platelet activation and aggregation through the irreversible binding of its active metabolite to the P2Y12 class of ADP receptors on platelets. - Patients with unstable angina (UA) or non-ST-elevation myocardial infarction (NSTEMI). - Patients with ST-elevation myocardial infarction (STEMI) when managed with primary or delayed PCI. Treatment should be initiated with a single 60 mg oral loading dose. Continue at 10 mg once daily with or without food. Consider 5 mg once daily for patients < 60 kg. Patients should also take aspirin (75 mg to 325 mg) daily. Geriatric Use: Patients > 75 years of age who received Prasugrel had an increased risk of fatal bleeding events (1.0%) compared to patients who received clopidogrel (0.1%). Hepatic Impairment: No dosage adjustment is necessary in patients with mild to moderate hepatic impairment. CABG-related bleeding: Risk increases in patients receiving Prasurel who undergo CABG. Pregnancy Category B - There are no adequate and well-controlled studies of Prasugrel use in pregnant women. Reproductive and developmental toxicology studies in rats and rabbits at doses of up to 30 times the recommended therapeutic exposures in humans revealed no evidence of fetal harm; however, animal studies are not always predictive of a human response. It is not known whether Prasugrel is excreted in human milk. Because many drugs are excreted in human milk, prasugrel should be used during nursing only if the potential benefit to the mother justifies the potential risk to the nursing infant.